You'll never see what you are looking for if you are not looking in the right place. 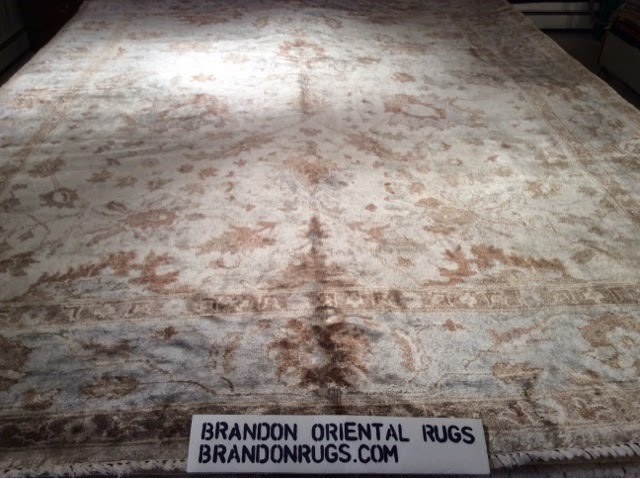 Brandon Oriental Rugs helps you find the fine quality handmade oriental and decorative area rugs you are hoping to find. Our Rug-Search(tm) service uses everything important to you (colors, size, design, origin, quality, price, immediate availability) to find rugs that will be uniquely right for you. It amounts to a match-making service that will amaze and surpise you. Come and see what you can truly have. Looking for an Answer About What to Do with a Bare Expanse of Floor in Your House? 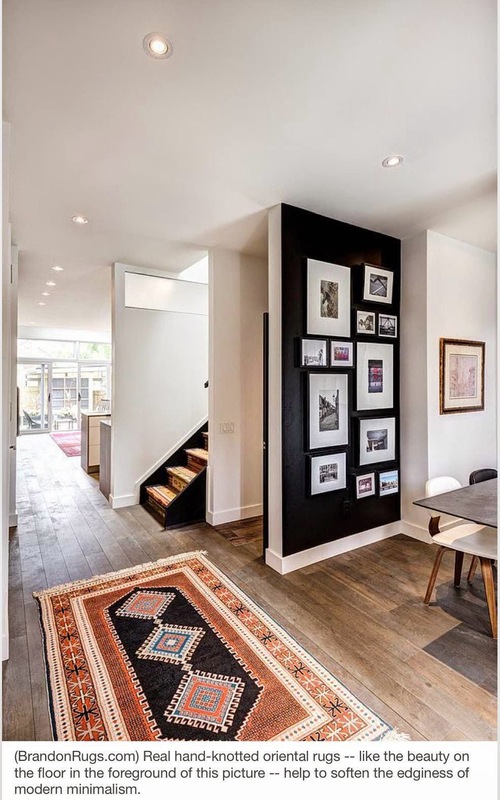 Oriental Rugs Are the Beautiful Answer. 1.) 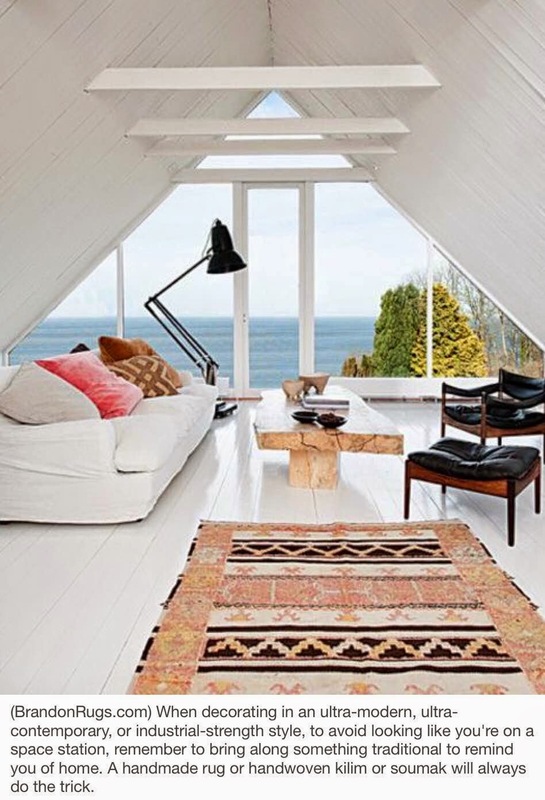 Oriental rugs soften the edginess of modern minimalist decorating. 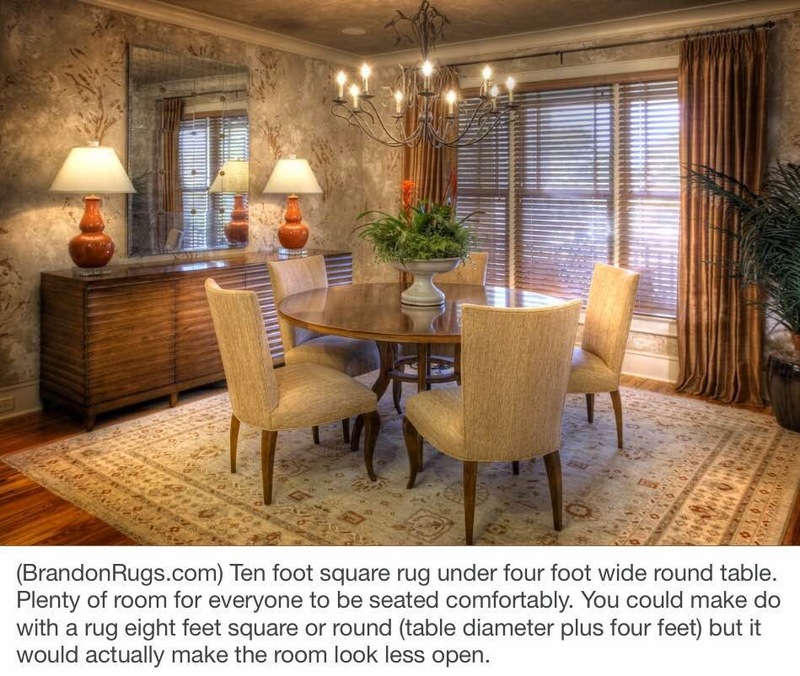 2) Fine quality area rugs can help to make that which is rugged and individual very comfortable. 3) Size matters. Bigger can actually be better when you consider what size and shape you want. 4) With backup assistance, something small can do a really big job. 5) Because of the big impression handmade rugs make, even a small investment made to bring them into your room decor will look like a smart investment yielding lots of dividends. 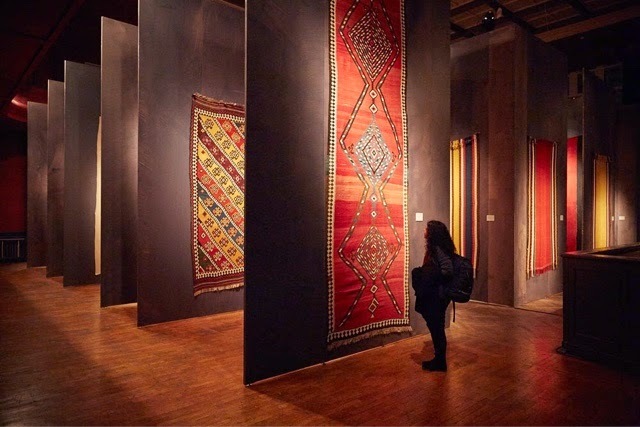 6) It takes a lot less stuff to complete the decorating of your room, if you make sure to use a real oriental rug as one of the items of furnishing. 7) "Beauty is in the eye of the beholder", and you know better than anyone what you like; so trust yourself when it comes to choosing the rug you want. 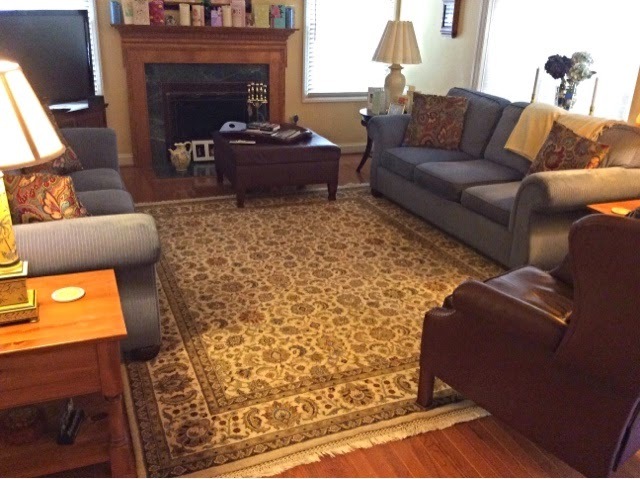 Our customer, working through her designer in Chalfont, PA, purchased this rug from Brandon Oriental Rugs in 2005. She called today and asked us to take the rug for cleaning after ten years of hard daily use in the family room of her home. When we arrived and examined the rug for intake, we could NOT in good conscience offer to clean the rug, or charge for service that the rug in fact does not need. Our customer confessed to vacuuming once or twice a week; and no more. If this had been a piece of carpet, wouldn't it need replacement at this point? If this had been a tufted (so-called handmade) rug, it definitely would have had an odor; it definitely would have had lots of decaying latex rubber dust underneath; and it definitely would not be worth cleaning. Granted, our customer spent more for their rug than if she had decided to buy carpet, or a machine-made or tufted area rug. But this real oriental rug still has its original value; and still has a lifetime (a human lifetime) of use ahead of it. Those other choices would be worthless at this point, having spent their usefulness; and beyond hope of being cleaned or repaired to extend utility. Please join us in applauding our customer for a great choice ten years ago: a REAL smart choice. In the next week much of what you see here will be wrapped and put on trucks for transfer to multiple vendors at the Spring 2014 Furniture Show in High Point, NC. REAL savings on REAL handmade rugs. 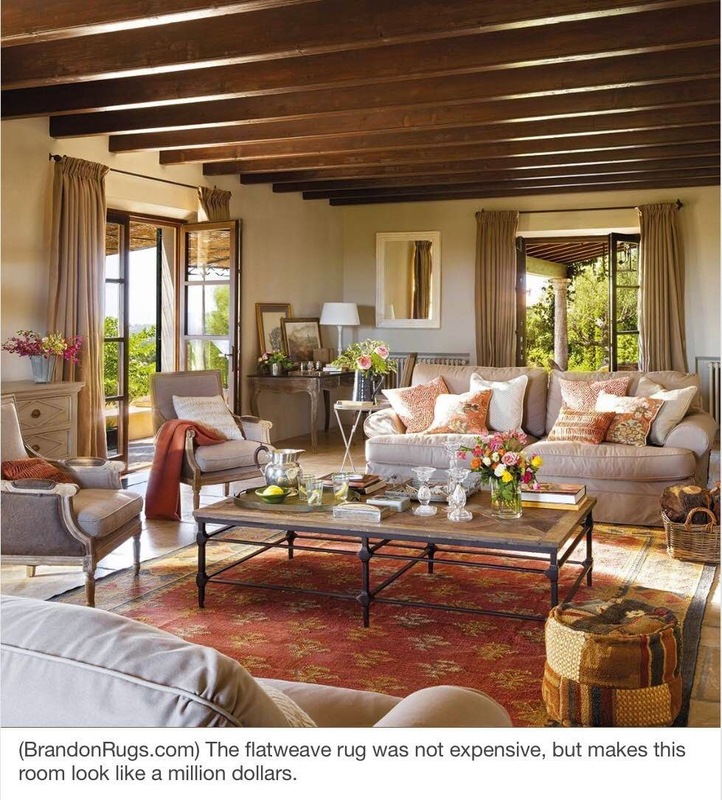 All who have purchased rugs through us know, "Brandon's everyday price is as good as it gets." So 20% OFF that everyday price is a REALLY BIG DEAL. Plus, the sale price is complete! It INCLUDES: applicable sales tax, AND rug padding, AND free delivery with installation, AND complete appraisal documentation for your protection. the great deal you get everyday at Brandon Oriental Rugs. New Horizons (Outside above Listed Areas)? Invite us to help you. We look forward to opportunities to explore new horizons. 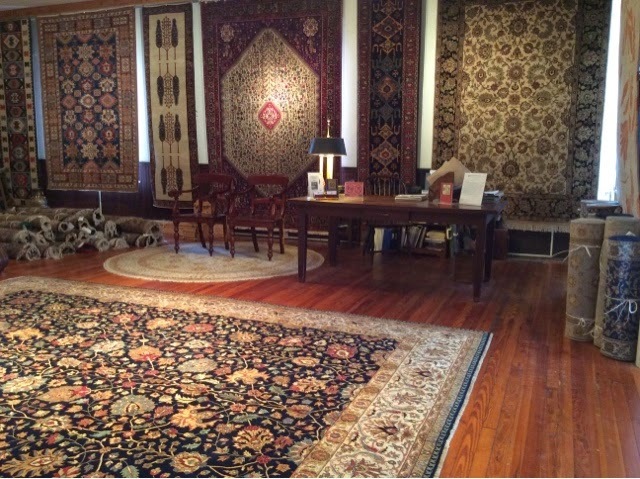 If we cannot help you with direct-to-door service, we are always pleased to answer questions and offer suggestions of value to you relative to your interest(s) in fine quality handmade rugs. Please give us a call if you need help. The first two pictures below are of a rug we sold to a customer in 2006 (a couple of years before the "financial meltdown".) 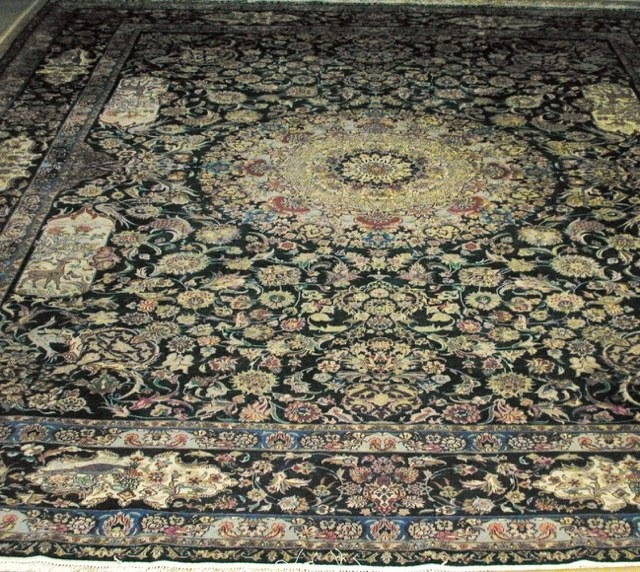 The rug shown is characteristic of the style and quality that was most popular at the time (and for most of the twenty-five years Brandon Oriental Rugs has been a company.) We're sure you can appreciate the intricate detail, and the large number of colors that make this rug truly beautiful. The picture below is of the back of the rug above. 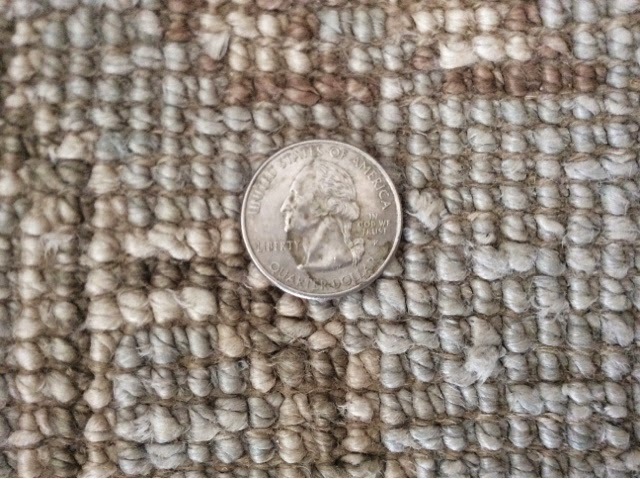 The Quarter is a standard of measurement approximately equivalent to one square inch, and permits you to appreciate the almost incredible detail of the hand-knotting technique -- yes, each little dot is a knot individually tied by hand! 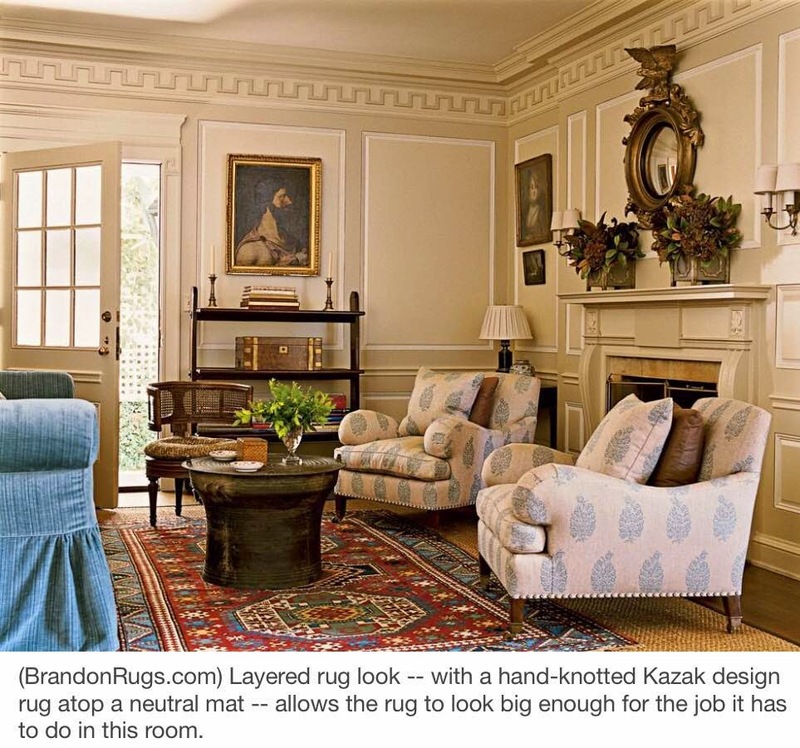 This rug has over 400 hand-tied knots per square inch! The rug below is a reproduction Turkish Oushak made in India. Before 2008, there was little interest in rugs like this; and it was a tough sell. Post-2008, because it is among the least expensive truly handmade qualities available (NOT "tufted"; NOT "hand-loomed"), it has been relatively popular. Notice that compared with the rug above, it has considerable fewer colors and much less detail. A look at the back of the rug (shown below) reveals that it is put together with barely forty hand-tied knots per square inch! 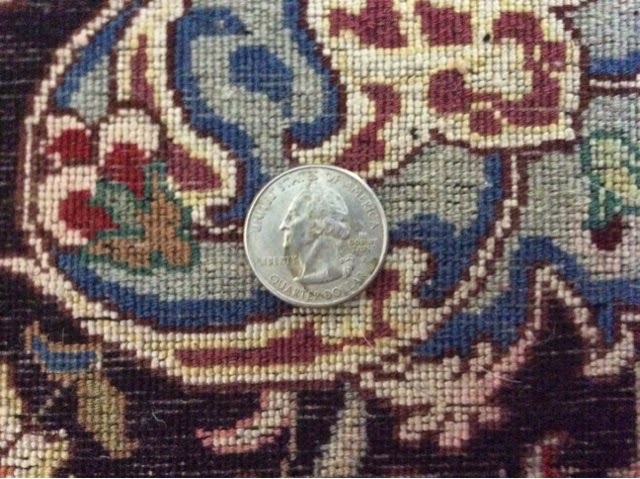 It is less costly than the first rug shown above (when compared on a price per square foot basis), but the savings are NOT proportional to the dramatic dropoff in work-manship and time invested to produce this rug versus the first. The second rug has barely one tenth the number of knots. (Consider that if the first rug took three hundred days to produce, this rug took thirty.) But this rug is sold at one third the price of the first, NOT one tenth. So you can appreciate that it is actually more costly for lesser quality. 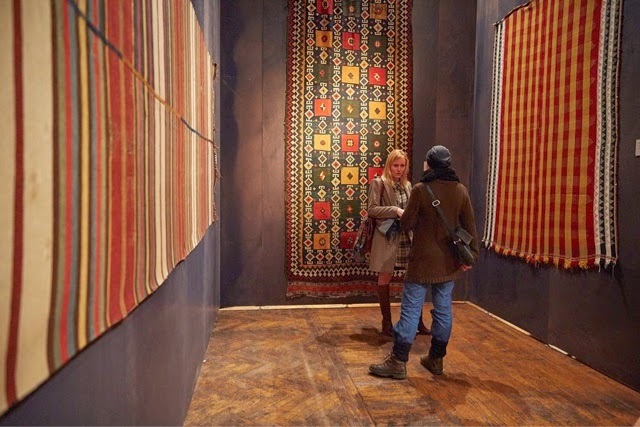 Rug buyers focused mainly on price (due to reduced buying power) are buying lower price rugs; but they are actually paying much more per knot than they were when Quality was the primary focus of their search for handmade rugs. It's a kind of hidden inflation that should not be ignored by the savvy consumer. 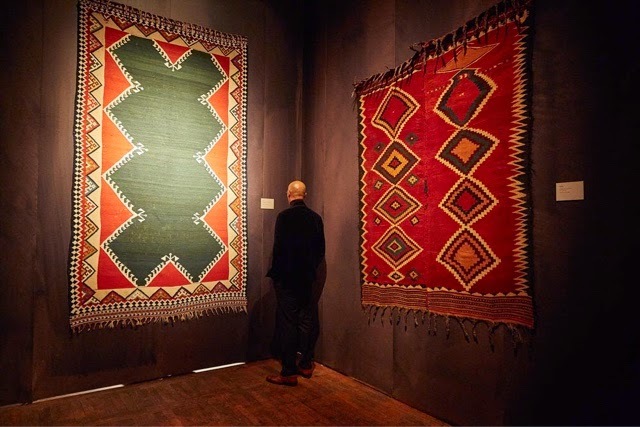 We invite all to consider if the dramatic change we have seen in the style and quality of rugs available was motivated by "fashion", or if it was due to economic pressures. 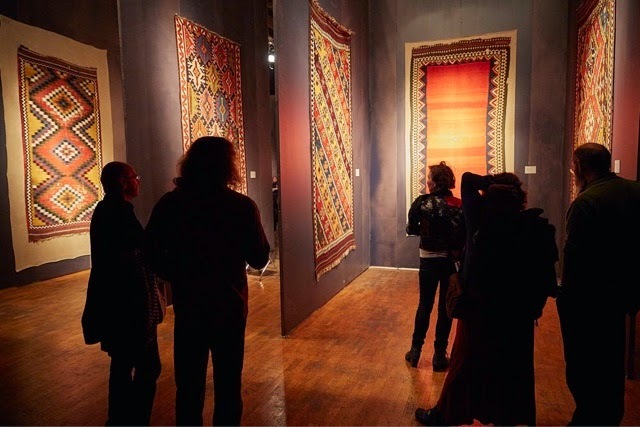 Truth be told: as the "slow but steady recovery" progresses, demand for traditional, high quality rugs has returned. This is beginning to catch rug-producers who made low quality rugs during the downturn with a lot of inventory that smart consumers are never going to want. 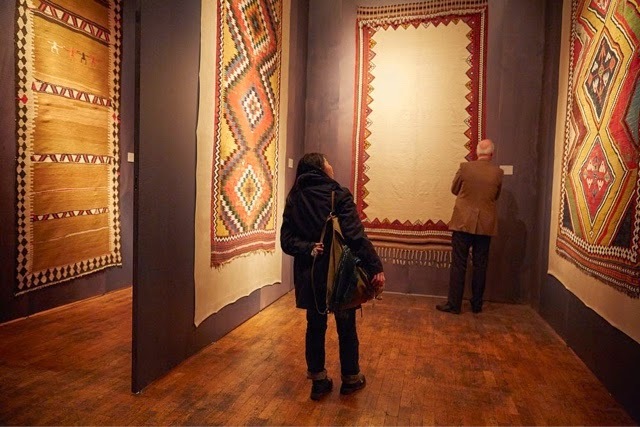 As we have demonstrated, those cheaply made rugs are NOT as inexpensive as they should be, and value shoppers are again looking at quality rather than "lowest price" as their definition of where value is found. Is That Really an Antique Rug? 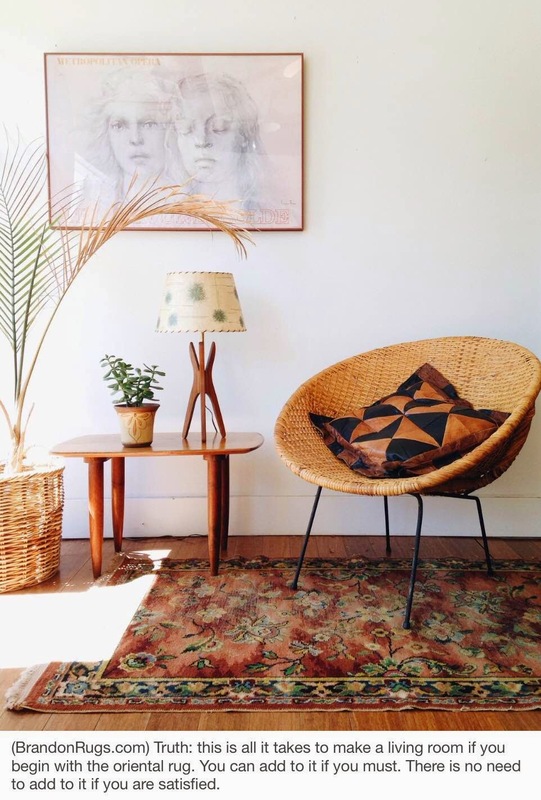 Antique Rugs Might Not Always Be As Old As You Think. 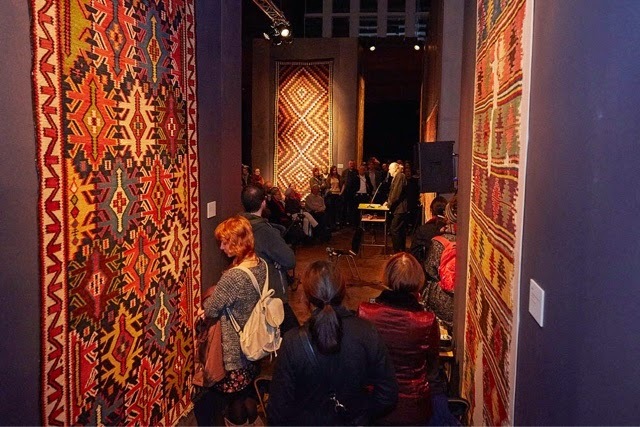 The photos from a rug exhibit discussed in a past issue of Hali magazine (http://bit.ly/1weMzJp) show that rugs can perform stupendously as pictures at an exhibition. Though not all rug styles are suited for duty on the walls, not all rugs are necessarily relegated to service on the floor. 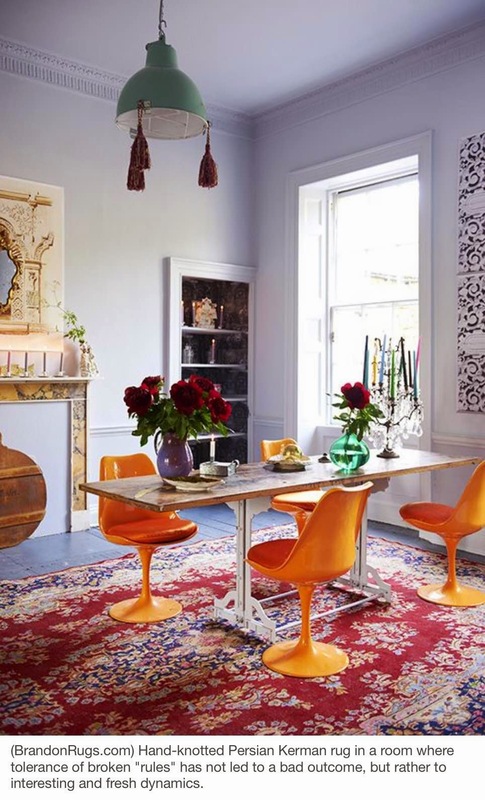 Many rugs are quite versatile, having design characteristics that allow their display within the home in different ways.